The South Brunswick PD and the New Jersey Division of Consumer Affairs continue to provide the Project Medicine Drop box at the police department lobby. Project Medicine Drop allows residents to safely dispose of unused, unwanted or expired medications 24 hours a day, 7 days a week. We accept pills, capsules, patches and pet medications. We do not accept syringes/sharps or liquid medications. Project Medicine Drop is an important component of the New Jersey Attorney General’s effort to stop the diversion and abuse of prescription drugs, including highly addictive opiate painkillers. 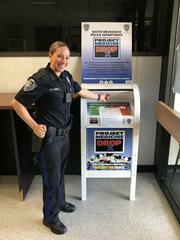 Through this initiative, the New Jersey Division of Consumer Affairs installs secure “prescription drug drop boxes” at State Police barracks, sheriff’s offices, and police departments throughout the state, including two military installations and several college campuses, allowing citizens to safely dispose of their unused, excess, or expired prescription medications. Empty your medications into a plastic or ziplock type bag, tie or seal the bag and place into the drop box. Please do not put medication containers/boxes into the Drop Box. 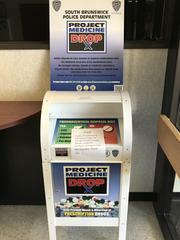 The Drop Box is located in the lobby of the South Brunswick Police Department. Contact Property and Evidence Custodian John Klemas @ 732-329-4000 Ext. 7447 if you have any questions. Eden Autism will be conducting their annual 5K run on Sunday September 30 within the borders of South Brunswick and Plainsboro. Mapleton Road will be closed to through traffic at the Plainsboro border between the hours of 7:00am and 10:30 am.